El Gimnasio Más Grande del Mundo/The World’s Biggest Gymnasium | ¡VidaMaz! Every morning we’re privileged to walk the malecón, our front yard, Mazatlán’s 10 km oceanside promenade. Sometimes we walk it again in the evening, just because it feels so good. We expected when we first moved here to love the views, the sunsets, sunrises, watching the sailboats and the party boats, the catamarans and the parasailers, the oyster divers, shrimp boats, cruise ships, ferries, and the jet skis. The really remarkable thing to me after living here awhile, however, is realizing that the malecón has got to be the world’s largest gymnasium (and swimming pool). 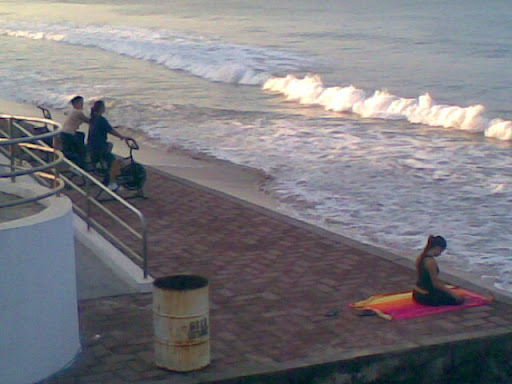 The photo above left is of a few spinning bicycles, and a lady practicing yoga, in one section of the malecón. As you can see, exercising on the malecón is both an incredible audio and visual experience! Below I list just some of the myriad exercisers and health nuts we see every day, all day long. The walkers: fast and slow, limping and smooth, sometimes with a walker, in expensive sports shoes or recycled tires, wearing sweat-repellant high-tech fibers or charity duds, some in the midst of such heated conversation they fail to notice anyone else, others greeting, hugging and kissing nearly every person they meet, the guy who squeezes a ball in his hand as he walks, those who carry weights and do arm lifts as they walk, those who take a few steps and then lunge, those who walk backwards, those who listen to ipods, and those who walk dogs (or whose dogs walk them). Joggers: old and young, fat and slim, jolly and focused, that guy who jogs with his arms stretched straight out in front of him, the lady who swings her arms hard enough to knock someone out, and the guys who pump their arms. There are joggers with both knees bandaged, or braces on both knees; but they are jogging. The runners, and boy do some of them run, evidently from one end of the malecón to the other! Every day! Maybe more! Rollerbladers: newbies, professionals, those who stumble, those who go 50 kph, those who wear pads and helmets, and mostly those who don’t. Those who use the cement benches for sit-ups and stomach crunches. Those who use the steel railings for push-ups and leg stretches. More joggers: those who jog in the hard sand and those who really get a workout in the soft sand. And, unbelievably, those who jog backwards in the sand (thank goodness they don’t usually do this up on the malecón itself). More walkers: including those who have shoes and those who go barefoot, and those who stop to collect shells. And even bicyclers: yes, mostly vendors, but those who commute, too, and have much stronger thighs than I do! Those practicing yoga: usually they are in a group, with bed sheets spread out over the sand. There are quite a few different groups, with various teachers, meeting in various places at different times of the day. Tai C’hi: taught by our friend Rick in the Taboada on Tuesday eves and Saturday mornings. Those people who wield those sticks into contortionist poses. Looks like a martial art, but I’m not sure what it is. Sports teams: including beach volleyball, futbol soccer and futbol americano, but also teams from schools who hold gym classes on the beach. Those incredible swimmers, who swim long distances down the coast and back, alone and in groups, with wet suits and without, those who have done it for years and those who join a class to shape up or improve swim strokes. There is an official “swim club” down near the fishermen’s pangas, and anyone can go early on Saturday or Sunday for lessons, during which they teach you to swim in the ocean and learn the currents. Ocean swimming is a completely different sport than pool swimming, of course. Some basic info on the malecón. Learn a bit about the malecón. 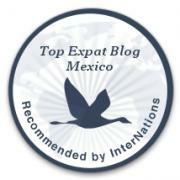 Pingback: Infographic on Our Malecón | ¡VidaMaz!